Shabu Shabu is a popular Japanese-style hot pot where the meat and assorted vegetables are cooked in a flavorful broth called kombu dashi. Everyone at the table takes part in the cooking and enjoys the ingredients with different dipping sauces. It’s intimate yet casual, and a whole lot of fun! It’s the holiday season and it’s the time for friends and family to get together. What’s the best Japanese meal for this occasion" It’s Shabu Shabu (??????)! 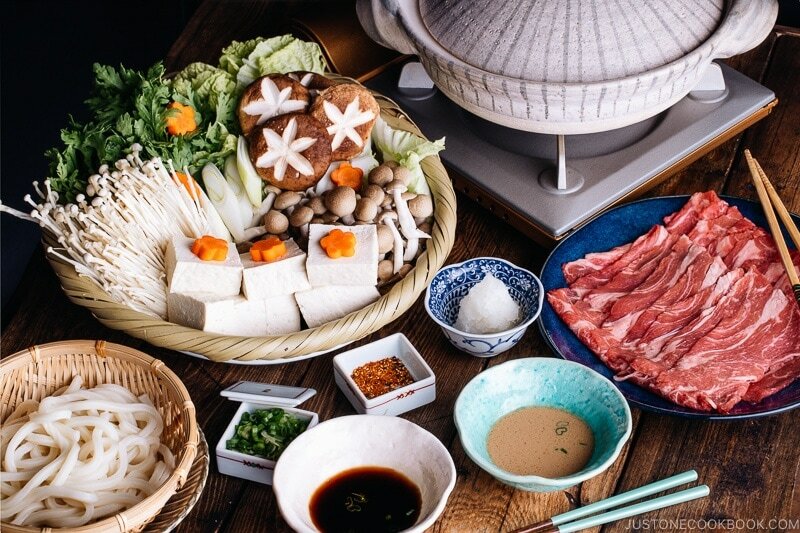 Shabu Shabu is one of Japan’s most popular hot pot dishes along with Sukiyaki. The name “shabu shabu” is Japanese onomatopoeic. It came from the sound when you stir the vegetables and meat with your chopsticks and ‘swish swish’ in the hot pot. It’s a fun meal since everyone sits around the hot pot at the table, cooks together, and eats while you chat, like fondue! A communal dining experience that inspires good appetites and brings people closer together. Shabu Shabu is a popular Japanese-style hot pot where the meat and assorted vegetables are cooked in a flavorful broth called kombu dashi.